Queen concert ticket stubs 5-21-1982 Munchen light tear at top of ticket, 12-16-1977 San Diego, 5-29-1982 Leeds Hot Space Tour - ticket will look great in your collection or they will make a great gift for that Queen fan in your life. 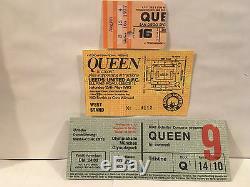 The item "Queen Concert Ticket Stubs Set Of 3" is in sale since Thursday, September 20, 2018. This item is in the category "Entertainment Memorabilia\Music Memorabilia\Other Music Memorabilia". The seller is "chuckyo" and is located in Welland, Ontario. This item can be shipped worldwide.